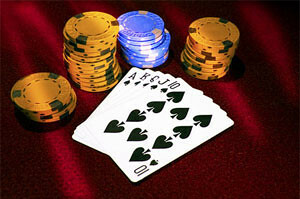 Texas Hold’em Poker is one of the most popular card games in the world. The online poker boom took place in 2003, when Chris Moneymaker won the WSOP Main Event. Since that time the poker has turned into something special. Nowadays many people are making a living playing online poker tournaments or cash-games. Many of them have earned a fortune doing so and quit poker, to do something more enjoyable with their lives. As poker is a game of skill, it consists of a strategy. Players with a better overall strategy end up as the largest winners. The very first thing for someone, looking for how to start playing poker, is to learn the rules of Texas Hold’em. Don’t worry! They aren’t complicated. And it will take you only a few minutes to learn. There’s a saying about Texas Hold’em: it takes a minute to learn, but a lifetime to master. It’s surprising enough that there are only two reasons for betting in Texas Hold’em. They are for value and as a bluff. The term ‘Value Bet’ relates to such a player who thinks that he holds the best combination in a particular. Thus this gamer bets it hoping his opponent will call. As this is a simple term itself, value betting is one of the foundations and the most important parts of the game. The term ‘Bluffing’ is used in case a player bets with a weak hand and hopes his opponent will fold. Hopes wouldn’t be the appropriate term to use, though. As a good poker player is able to calculate whether a particular bluff is good or not. Poker is also a game of position. As each player sits at a specific position at the table. It changes with every hand. Position is one of the most important aspects of poker. However, it’s considered to be a basic and easy to learn/use strategy. A brief look into position will teach you that the closer to the button you get, the better your position is. The reason for it is simple. The button gets to act last pre-flop and post-flop (except for blinds pre-flop). Acting last is a huge advantage. As you have the maximum amount of information regarding what other players will do in the hand! There are many things that are incomplete in poker. One of them is information. So poker is a game of incomplete information. You can never know exactly what your opponent holds. However, when getting some information about that, you can make shrewd and logical guesses. Every time you sit at a poker table, you have to concentrate. Watch all the hands that are played at your table. Then you can gather information about how other players play. If you play online poker for Mac at poker tournaments or cash-games, you can take notes directly in the poker client. Write down any specific things a particular player does. This might help you in future!